If you’ve spent any time at all reading this blog, you know that, from time to time, I like to gingerly dip my toes into whisky history, distillery info, regional arcana, fun stories of excruciating regret, preposterous heroism, and petty minutia. Hell, I don’t know why…probably because I like lore and information and often there’s a bit of lore and information about a whisky somewhere that adds a bit of romance to it (no, not the necking-in-the-back-of-a-car, your-ear’s-caught-in-my-zipper kind of romance). These stories give a bottle a sense of place, maybe of an older time, and in a way, subtly influence the “flavor” of each sip more so than would a story about Bill Parker, who when driving a semi full of cased whisky, just about jack-knifed the thing when some jerk with Illinois plates cut in front of him without signaling on the I-64 outside of St. Louis. There’s no romance in that. Anyway, I like finding this stuff out, I like writing somewhat accurately about it. So I was all excited (sort of) to find out where the Four Roses name came from, who founded it, who floundered it during prohibition and which faceless multi-national conglomerate owns it today. 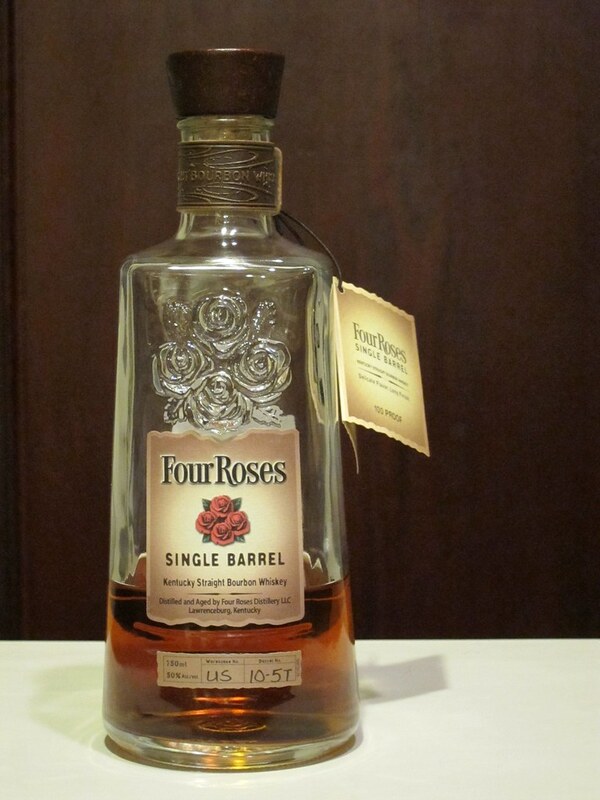 However, after my usual, obligatory 27 minute research period, I was dismayed to find that the origins of the name, and to an extent, the origins of Four Roses Bourbon itself are not that clear, cut, and/or dried. Depending on the source, the name either comes from two brothers and their two sons who were named Rose, or the four-flowered corsage some demure Southern belle wore as sign to her shy, bourbon-making suitor that, yes, she would marry him and thanks for asking, or alternately, that the aforementioned shy suitor actually got turned down and channeled his unrequited energies into making a damn good bourbon, or that the distilleries original founder, Rufus Rose, was so touched by the sight of his four flower-wearing daughters on the eve of the big ball that he decided to name his whiskey after the moment, Or possibly, given that the interwebs can actually be wrong sometimes, none of these stories are true. For example, ol’ Rufus actually only had one daughter, so unless he mistook his wife and a couple of other ladies for daughters he didn’t actually have (possible, I guess), that story seems pretty darn unlikely. Ok, all this rambling leads up to this: Four Roses has a strange and complex history that’s mildly interesting and if you’re interested in learning more, I found a lengthy though somewhat old article here that details all the sordid details. I’ll just stick to what I know, and that is that today’s Four Roses Distillery is owned by the Kirin Brewing Company and is one of Kentucky’s largest distilleries. Their bourbon is unique in that they make whiskey from 10 different recipes, two mashbills and five different yeast strains, which creates a wide palette of whiskey to work with. They also warehouse their whiskey, not in the traditional multi-floored bourbon rickhouse style, but in one-story warehouses, which probably consolidates the maturation process to an extent. The Four Roses Single Barrel expression is approximately 8 years old and made from a mashbill that reportedly has a 35% rye content, making it one of the rye-est bourbons out there. Rye-est is not a word by any stretch, but you get my meaning. The Nose: At first sniff, an incredible, soft, rich, round wave of honey, butter cookies and ripe oranges. A bit more time reveals great notes of vanilla, fresh corn bread, and cinnamon. To balance this all, just the right amount of earthy green spice from the rye and the wood. The Palate: The entry is all complex honey and caramel, a wonderful perfectly balanced sweetness. The spiciness barely hinted at with the nose grows insistently with toasted corn bread and roasted nuts giving way to cinnamon and clove. Towards the end there’s a terrific, big wallop of rich rye sitting in an old leather armchair. The Finish: Longish and warming with sharp rye and those holiday spices, cinnamon, clove, vanilla, and nutmeg floating along. Thoughts: Bearing in mind that this is a single barrel and other bottlings are bound to be somewhat different…what a beautiful bourbon. Not only is there a great complexity of flavors here, there are the deftly balanced textures and waves that deliver them as well. Strong and rich with a wonderful subtlety and smoothness, this single barrel shows off the mashbill and the wood in near perfect harmony. Highly recommended. This is a beautifully complex and layered Bourbon. Highly recommended.